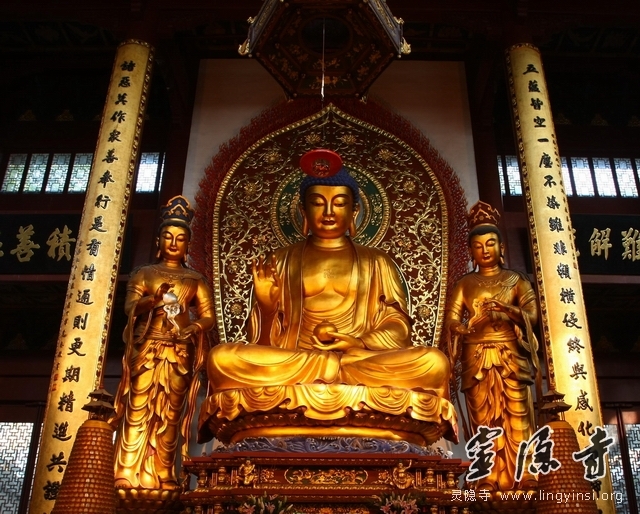 As the third hall in Lingyin Temple, Medicine Buddha Hall is situated behind the Grand Hall. Rebuilt in 1993, this hall is a single-layer building with a double-eaved hip roof, which consists of seven rooms extending across the width of the hall and three rooms running the depth of the hall. Inside the hall worships the statues of Medicine Buddha, flanked by two Bodhisattvas, Suryaprabha and Candraprabha, symbolizing sunlight and moonlight respectively. The three of them are referred to as “Three Sages from the East”, or “Three Great Medicine Bodhisattvas”. Medicine Buddha, also named as Bhaishajyaguru (meaning the Medicine Buddha of Lapus Lazuli Crystal Radiance), is the Buddha of the eastern realm of Lapis Lazuli, which is a Buddha land of serenity and solemnity. Everything there is pure and crystal clear, free from the filthy ground, as well as the three evil paths to hell. Everyone’s body and every inch of the surroundings are as stately and splendid as in the western pure land of ultimate bliss. As a Bodhisattva, the Medicine Buddha made twelve great vows among which the seventh vow was “to help relieve the destitute and the sick”, and therefore, he is commonly called the “Medicine Buddha”. Due to his second vow “at the moment of obtaining enlightenment, the body will be like lapis lazuli, clear inside and outside without fault, emitting vast light exceeding the sun and moon”, he is also named “Lapis Lazuli Crystal Radiance”. Suryaprabha Bodhisattva, also named as the Sunlight Bodhisattva, is the left attendant of the Medicine Buddha. Candraprabha Bodhisattva, also named as the Moonlight Bodhisattva, is the right attendant of the Medicine Buddha. As two siblings serving the Medicine Buddha in the eastern realm of Lapis Lazuli, they are the two greatest Bodhisattvas among innumerable Bodhisattvas in Buddha land, who excel in upholding the Dharma of the Medicine Buddha. On both sides of the Medicine Buddha Hall stand twelve statues, called as “Twelve Divine Generals of Medicine Buddha”, “Twelve Great Yaksa Generals” or “Twelve Divine Guardians of Medicine Buddha”. They all wear armor, topped off with a helmet or spiked hair, looking quite menacing and powerful. As attendants of the Medicine Buddha, the Twelve Divine Generals protect and serve the one who is holding Yakushi Sutra. They take turns to offer protection to sentient beings during twelve hours of day and night, and twelve months in four seasons. Their names are: Kumbhira (armed with yellow vajra), Vajra (armed with white sword), Mihira (armed with yellow vajra), Andira (armed with green mallet), Anila (armed with red trident), Sandila (armed with black sword), Indra (armed with red staff or halberd), Pajra (armed with red mallet), Makura (armed with white axe), Kinnara (armed with yellow rope), Catura (armed with green mallet), and Vikarala (armed with red three-pointed vajra). 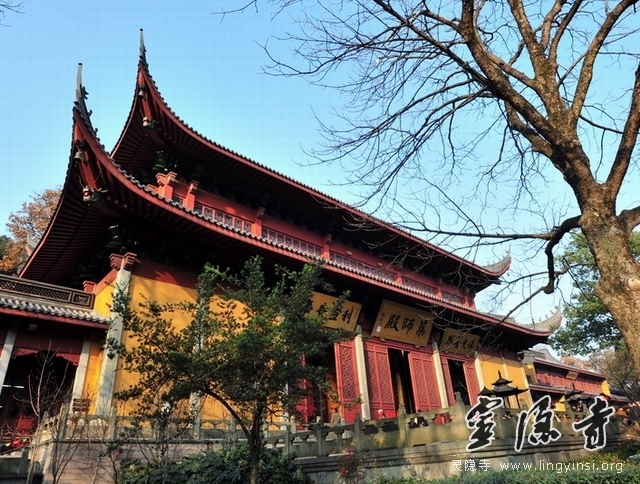 The plague hung above the hall is inscribed with Chinese characters “Yao Shi Dian” (meaning Medicine Buddha Hall), written in beautiful and vigorous calligraphy by Zhao Puchu, the former president of The Buddhist Association of China.